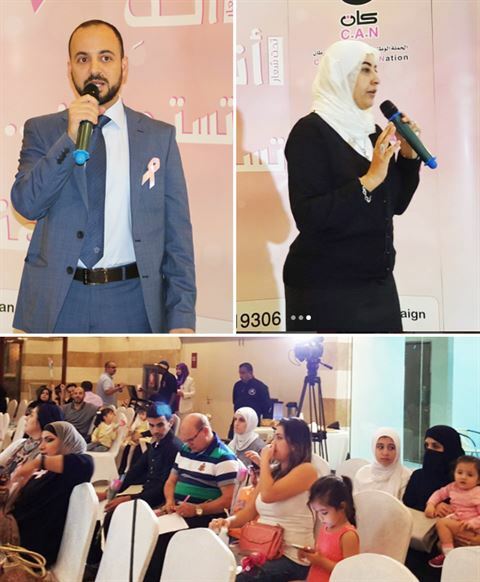 The Sultan Center organized a Breast Cancer Awareness lecture at TSC Souq Sharq on Thursday, October 12, 2017 in support of Breast Cancer Awareness month. In collaboration with Cancer Aware Nation Association (CAN), New Mowasat Hospital and Jarallah German Specialized Clinic, all efforts were joined encouraging women to have early regular checkups and adapt a healthy lifestyle. Breast Cancer is the most common type of cancer amongst women; therefore, the lecture shed light on the prevention and early detection of cancer. Through his speech, TSC’s Commercial Director – Mr. Makram Malaeb- stated: “In support of Breast Cancer Awareness Month, we've put together awareness programs that provide our customers with valuable information on the importance of early detection and testing options available to them”. “TSC is providing customers and colleagues a full circle of care translated by our awareness campaigns, in addition to spreading a culture of healthy living & eating habits by offering different variety of heathy and organic products”. One of the other spokespersons in the lecture was Dr. Najlaa Alsayed, Internist and Oncologist specialist at Hussain Makki Jumaa Cancer Hospital, who gave out an engaging lecture to customers and attendees about breast cancer’s early stages and the importance of health screenings, self-examination and early detection in preventing cancer. From her end, Dr. Ala’a Alawali, nutritionist of New Mowasat Hospital, engaged with customers in an informative lecture talking about healthy lifestyle by adapting alkaline diet to prevent women from developing cancer cells in to their bodies. She also pointed out that cancer survivors need to adopt healthy eating habits and include more fruits, vegetables and whole grains and keep red meat to the minimum in their daily routines. This can help keep weight in check, give the body the nutrients it needs and the energy needed to make it through a busy day. In addition to the beneficial information given during the event, there was a special stand where attendees were able to do blood pressure and sugar check-ups. TSC also rewarded the attendees with healthy giveaway bags filled with different organic range of products that can be found at TSC stores. TSC obtains a distinguished corporate social responsibility program, as a leading retailer in Kuwait, through which the company conducts awareness campaigns to support the community in which it operates.